Shipping & Receiving Packaging Benches - EGA Products, Inc.
EGA Products was commissioned by a world renowned manufacturer of agricultural and construction equipment to design and manufacture customized Shipping & Receiving Packaging Benches or handling small tractor parts. 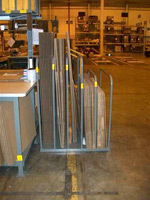 Along with ergonomic design and exceptional durability, these benches also need to integrate a computer keyboard and hard drive that are central to the company’s barcode inventory control system. 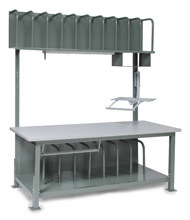 Analyzing the time/motion requirements surrounding the company’s shipping & receiving operations, EGA engineers designed a packaging bench with an exceptionally durable work surface, and ergonomically placed compartments for boxes and other packaging materials. Rely on EGA precision engineering and manufacturing expertise to design and build customized shipping & receiving packaging benches like these, and other equipment that will meet the specific people-access, materials-handling, or storage needs of your industry and its processes—no matter how simple or complex your requirements.